Playstyle: Any; We promote a diverse community that accepts role-players and meta-gamers alike. You might be asking yourself, who or what is Vandiir? We are a duchy focused on progress, with both the influence and motivation to achieve our dreams. The people of Vandiir are very driven individuals with unique goals and bonded by their shared love of Chronicles of Elyria and other games. Vandiir is a close-knit group, but not an isolated one. We are always happy to accept new people into the fold. One unique aspect of Vandiir is our approach to gaming. We call it “Science”. Our people truly enjoy trying out new ideas in games and get very excited about developing effective new methods. This science gets applied to everything from architecture and building to farming and crafting. To be clear, this is not about exploitation of the system. Any bugs discovered in the process are reported to developers. The in-game characters of our ‘scientists’ simply enjoy the process of development and research as much as our players do for roleplaying purposes. [Mar 31st 2019] See more details in our new alliances section! The Duchy itself is led by the Duke and Duchess Samsara with the help of the titled players (Counts, Barons, Mayors) and multiple advisory councils. Vandiir has only officially established the Count Council and is developing plans for a Technocratic Council as well as any others needed based on the needs of the duchy. This council consists of one to two representatives per county; the title-holder (Count or Countess) and an appointed Second-in-Command of their choice. A technocracy is a group of scientists, engineers, and other experts who have political power as well as technical knowledge. This advisory council will be comprised of accomplished tradesmenn, engineers, and crafters. The purpose is to establish a thorough understanding of technical knowledge when making decisions and who better to ask than those accomplished in their fields? The details for how the members are chosen are still being determined, but there will be no title requirements for these positions. Menn from all walks of life can join on the sole basis of their skills. Baronies are by appointment of the duke but are completely open to discussion. 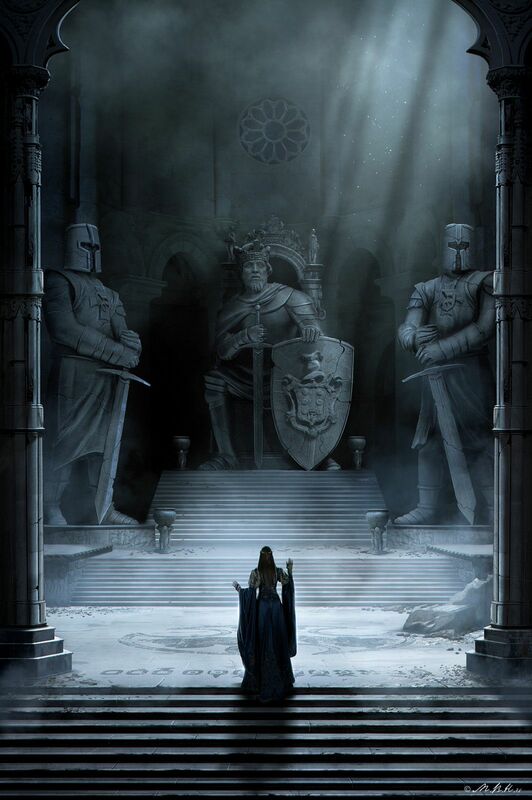 Barons have not been officially appointed yet in Vandiir and those interested in the position are noted within a private updated list. Baronies along the border will receive priority for funding and soldiers while those on the interior will be expected to focus on internal policing and security. We currently have two friends planning to play as our children, with no rights to succession or additional power. We are thrilled to welcome the Duchy of Thorne into the Kingdom 4 fold. We've known both Sersei and Sintax for years before they stepped up to the position to duke and know we will work very well together as neighbors. Vandiir has big dreams to develop both of our biomes. Projects that we would love to have more people involved in. The summaries below are kept short, but we are more than happy to discuss them in depth. When not being used for the Blood Sports, the seating and viewing areas can be repurposed for the display of other group events like tournaments or theatre. The time spent offline in Elyria is going to be just as important as the time spent online with Soulbound Studio’s implementation of the Offline Player Character (OPC) System. We have devised a series of walls and roads to be implemented in phases that will provide safe passage throughout the duchy. The Last Oasis is located within the same duchy where we have been hoping to place our duchy seat. Vandiir is more than happy to announce that not only is the Legendary Tavern physically inside of our intended placement, we are the rightful owners of the deed on the Angelica Server. We would like to give others the chance to take a part in this legendary building. As such, we will be accepting applicants to be a part of the projects focused around this historic site. Would you like to take a part in The Last Oasis? Check out our Vacancies Post! We will be supporting plans for schools of all levels as well as orphanages within Vandiir’s counties. We are additionally hoping to develop student, teacher, or tutor exchange programs between settlements to help settlements gain knowledge and skills not available in their immediate vicinity. One of the first and major steps to progress is Education. The Duchess of Vandiir is planning to implement a University that will sport two methods of education. The first option are individual classes offered to students of any age in return for a fee. Think of skill trainers in traditional MMOs. The second method is an escalator type school system for youths, similar to a real-life technical school in its intent to prepare them for career fields. This would be largely paid for through tuitions, but will also accept alternate forms of payment such as tuition reimbursement in exchange for an employment contract of a specified duration. In an attempt at preventing deforestation and the depletion of sustainable natural resources, we intend to have a garden where we collect plants and their seeds in order to stimulate the environment around us if it becomes necessary. Such a garden could also provide additional tourism and other benefits to the world of Elyria at large. Vandiir is looking for members of all levels. We encourage you to come and join us on our discord if you have questions about Vandiir or just want to get to know us better. Vandiir’s county spaces are more than half filled when we take doubles and triples into account, but there is still more than enough room to grow in either biome. That said, we are recruiting primarily counts interested in The Waerd at the moment. We are looking for more mayors interested in the position of Baron. We do not restrict our Counts from the position. Vandiir is looking for mayors and citizens of all types. Our Counts are diverse enough to provide anyone a home regardless of tribe, profession, or playstyle. Most positions that open up within Vandiir will be available to citizens leaving plenty of room for growth. Angelica Monarchs hoping and able to place in Kingdom 4 should come speak with us. As people interested in trading, mining, and crafting as the major forms of industry, we are the type who prefer to work with our Kingdom. Our dilemma has been a lack of interest on the monarch level for the placements that fit our community, and ultimately decided to post our intended location in Kingdom 4 in the hopes of drawing awareness to the area. Our specific placement within the Kingdom itself is one we determined after long discussions among ourselves and our counts, ultimately chosen through an internal count-level vote that won by a landslide. We have always hoped to be a border duchy with water access that can help protect our kingdom while leaving room for exploration. The Waerd were not our first choice, but one we came to as a compromise. Afterall, we do not want to use our status as a double duchy with high influence to push others out of their kingdom or hopeful tribes. The Waerd are without a doubt one of the least favorable tribes for duchy and kingdom placements among the leaders of NA-W, so we decided to take this area that others do not desire for themselves. As we learned more of The Waerd, we have truly come to love them. We have a diverse community, and this does mean settling in at least one non-Waerd location to meet our people’s needs. Neran is a highly desired tribe, but we have the community and ability to support and protect them. We also have a true need for an area that supports the non-PVP aspects of our community. We can take a step back to the edge of a cliff in the hopes of cementing relations with our future and unknown monarch, but we aren’t willing to take another step back and jump off the cliff completely. We truly hope this compromise is an acceptable gift showing our positive intentions. -The largest cause of war is selfishness. The hardest thing to achieve in life is mutual selflessness. I Aryes Were Count of Shirereve, Pledge allegiance to Vandiir and the House of Samsara. I am honored to call Vandiir my home, and to serve Duke Ptero and Duchess Plume. Those interested in Vandiir should also check out this thread by our Duke. Pteroguin's put a lot of thought into his proposal for the Raider's of the Lost Ark event, but is ultimately not a person to over-exaggerate the promises he makes. Pteroguin is very approachable and loves to talk about CoE. I greatly encourage you to reply to the thread for The Order, send him a message here on the forums, or join our discord to get to know us better! I rarely peruse the forums but I wanted to show my support! Very excited to formally announce our aligning, and looking forward to what lies ahead!